When 50,000 Corvette fans gathered inNashville, last year, to celebrate the legendary marque’s 50th anniversary, there was a palpable sense something was missing. Spread around the grounds of Titans Stadium, you could spot just about every possible permutation, from lovingly-restored first-generation 'Vettes to one-off Le Mans racers. What you couldn’t find was the C6, shorthand for the sixth-generation Corvette, that was originally supposed to be unveiled at the Nashvillebash. 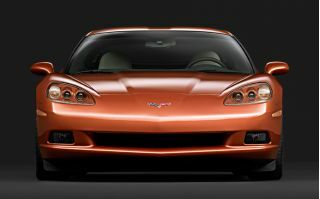 The project was pushed back a year by GM’s “car czar,” Bob Lutz, who wanted to ensure the C6 would not only be better than the vehicle it replaced, but that it would be a truly world-class sports car. Corvette fans — and there are many better described as fanatics — might take exception, but for much of its 51-year history, Corvette has had more in common with the classic American muscle car than with true sports cars like the Porsche 911. 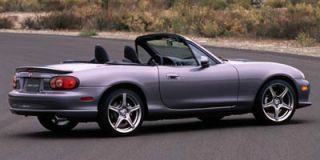 That began to change with the debut of the fifth-generation Corvette, in 1997, which had lots more to offer than just a badass V-8. And you knew it, just by looking at the C5, clearly a car transformed, the dramatic changes in its appearance underscoring what had been done under the skin. While the C5 came temptingly close, it had not quite chinned the bar. 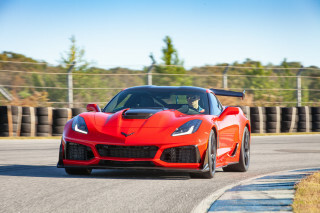 And so, despite his disappointment at the delay, Corvette chief engineer Dave Hill relished the opportunity to put a little more effort into the C6. The Corvette team pored over virtually every detail of the car, addressing everything from interior refinement to off-the-line acceleration. What they’ve wrought may not be apparent immediately. Unlike the revolutionary C5, the new car is what designers like to call an “evolutionary” update. At casual glance, there are plenty of folks who might not even realize they’re looking at a C6. 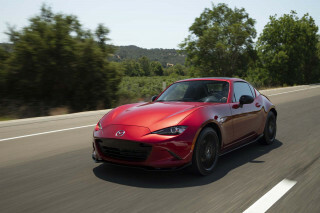 But spend just the briefest time behind the wheel and you’ll recognize this as an entirely new automobile — Hill likes to point out that 85 percent of it has been changed, at least if you measure by weight. Even the little things make a big difference. And so, for the first time, the new Corvette is absolutely ready to take on all comers. We took delivery of our C6 one recent summer’s morning, product manager Harlan Charles handing us the keys to what was just the 20th car to come off the line in Bowling Green, Kentucky. Journalists often get their first ride in early production cars, but we were immediately impressed by the lack of such start-up snags as ill-fitting trim pieces. to see what vehicles wind up in our driveway each week. And as Charles and I did a long walkaround, we couldn’t ignore the steady stream of commuters pausing to inspect the new Corvette. Not all were sure what they were seeing. At first glance, the C6 bears a strong similarity to the outgoing, fifth-generation 'Vette. 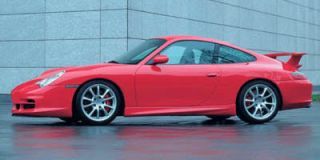 But closer inspection reveals some significant changes, such as the more elegantly sculpted tail, which resolves one of the old car’s biggest visual weaknesses. The most controversial? The decision to abandon Corvette’s classic pop-up headlights, but the new High-Intensity Discharge lamps offer several distinct advantages. There’s more light, for one thing, and HIDs fit into a tighter package. That helped engineers accomplish a critical goal. Though the wheelbase of the C6 has been stretched an inch, the 2005 Corvette is a full five inches shorter and more than an inch narrower than last generation — giving it essentially the same footprint as Porsche’s 911. 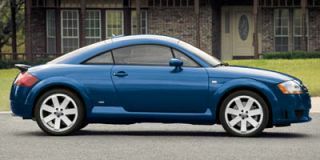 Curb weight for the base coupe has been trimmed 35 pounds, to 3179 lb, not all that much more than the Porsche. Corvette’s have always looked sleek, but when it comes to aerodynamics, appearances often deceive. The Corvette of the early 1980s created so much turbulence at highway speeds, it reportedly had a lower coefficient of drag (CD) when turned backwards in the General Motors wind tunnel. Last generation’s car had a slick .300 Cd. The new car cuts that to an impressive .286.
manners. Especially when you work in the big numbers. 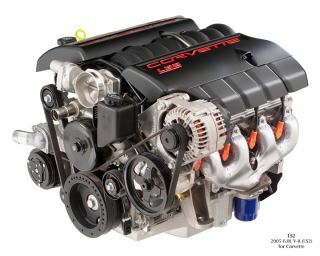 The C6’s LS2 V-8 has bulked up to a full 6.0-liters, while making an impressive 400 horsepower and 400 lb-ft of torque. Engine mounting has been optimized, improving weight balance to a near-perfect 51/49. There’s an optional, four-speed automatic, if you really must. But it’s a shame to miss the pure driving pleasure of the new, six-speed Tremec transaxle. The gear level has been shortened, as has the throw. We did miss a few at first, but it didn’t take long to get use to this intuitive package. Chevy engineers are proud to note that the new car has a better power-to-weight ratio than the outgoing 911. It will launch you from 0-60 in about 4.2 seconds in the base car. With its performance gearing, the Z51 package trims about a tenth of a second off that figure, putting the new C6 almost even with the old C5 Z06. 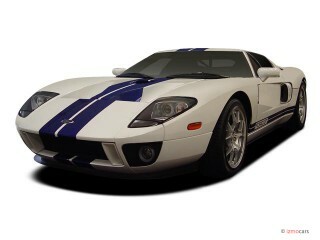 Top speed is a quick 186 mph. Corvettes have always been fast — at least in terms of straight-line acceleration. 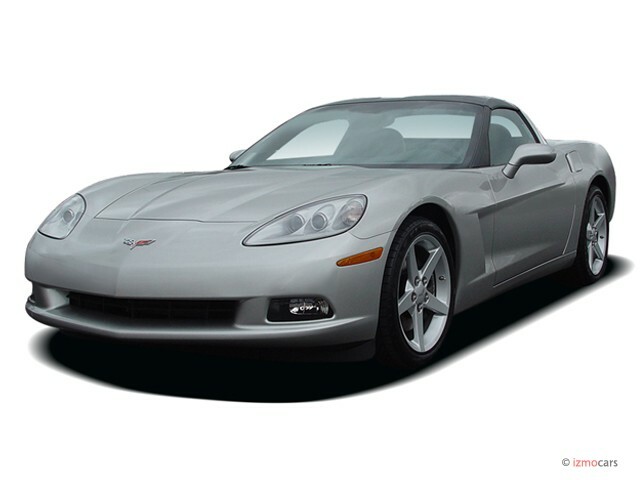 With the C5, Chevy started to compete where it matters to most drivers. And when it comes to tight and twisty roads, the C6 is going to give just about any competitor a run for the money. 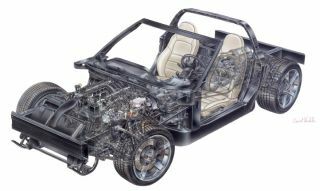 Held over from the last-generation, the new car uses a big torque tube and hydroformed rails to enhance its stiffness. There’s a new suspension cradle, and suspension travel has been increased more than half an inch. Three separate suspension packages are available, including a base mechanical system, GM’s sophisticated magnetic ride control, and the performance-oriented Z51 package. Even the base suspension has been notably enhanced. But we’re expecting strong demand for the Magneride system. In a nutshell, the shocks are filled with a a ferrous fluid that changes viscosity — its thickness, or ability to flow — in the presence of a magnetic field. The intensity of that field is controlled by computer sensors that constantly read and respond to road conditions and driver input. In sport mode, you get a firm yet compliant ride that locks the car onto the pavement. 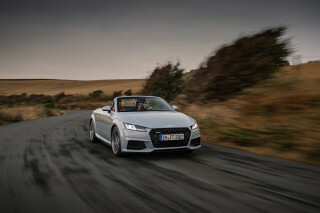 In touring mode, you sacrifice a minor bit of high-performance handling, but the car soaks up road harshness almost as smoothly as a luxury sedan. The Z51 package is for those who want to max out on performance. We’re talking stiffer springs and dampers, as well as a quicker gearbox and larger brakes, with drilled rotors. The Z51, as earlier noted, also brings its own set of gears for quicker take-off. 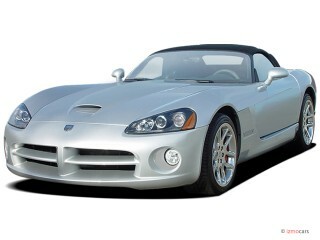 For those who expect to work hard driving a sports car — think Dodge Viper — the new C6 offers a pleasant surprise. “You don’t have to feel intimidated to drive this car, insists program manager Charles. And it’s an accurate assessment. Steering is easy and precise, with an incredible on-center feel. The car is incredibly predictable, with few surprises, no matter how you push it. It helps that the car is loaded with a variety of digital “helping hands,” including standard ABS brakes, traction control, and electronic stability control. Our Z51 package offered a push-button control to shift into various software settings, including Competition Driving Mode. It did not completely disable these systems but set them to intervene only when we might truly get in over our head. For adventurous drivers who disdain all these high-tech gizmos, you can shut the electronics off entirely, if you really want. Pushing a sports car to its limits can be challenging, so some subtle refinements on a car like the Corvette can be even more beneficial than on a big luxury sedan. Road noise, vibration, and harshness has been notably reduced. And there’s a markedly more sophisticated quality to the powertrain sound. Much of the brashness of the big V-8 has been tamed. What you now have is the best of both worlds: the invigorating roar of an American V-8, with the smooth refinement of a high-tech European engine. Part of that is due to a new, straight-through exhaust system. There are no more kinks around the spare tire well because the spare is gone. Chevy has put its trust in its run-flat tires, 18-inchers up front, 19s in the back. 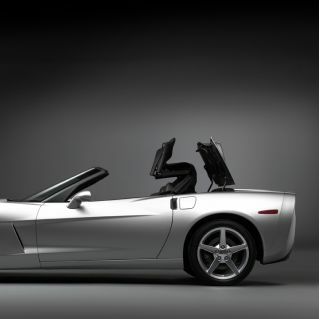 Complimenting the powertrain and suspension technology, the 2005 Corvette has become a digital showcase. There are new, fully-electric doors (though they’re backed up by mechanical emergency releases). There’s not only a keyless entry system, but keyless start, a nice way to get the car warmed up on a cool Michiganmorning. The system is a little quirky, requiring you to be in reverse when you shut down or your battery will continue to drain. In the creature comforts column, there’s an optional 230-watt, seven-speaker Bose audio system, with six-CD in-dash changer, or you can opt for a new navigation system. We were impressed by the new Head-Up-Display, or HUD, system, which puts a variety of information right in your line of sight. Without having to look down, this optional system can display such data as speed, cornering G-forces and turn-by-turn navigation instructions. There are plenty of firsts, at least for Corvette, including heated seats. It’s not the first 'Vette to offer an electrically-operated convertible top, but the last time such a package was offered was way back in 1962. After a simple manual operation, the top will fold down in just 18 seconds. Ergonomics are normally not something associated with sports cars, but Dave Hill’s team really thought through the location of every switch and dial. There are even two surprisingly effective cupholders in the new C6. We would have preferred a fully electric tilt/telescope wheel, however. The car comes with a tilt system, and the telescoping feature is an option. Seats are comfortable, yet supportive, and they can handle even a large, 6’2” frame comfortably. If we have one complaint, it’s the center stack. Why do manufacturers invest so much and then cut corners with cheap plastic surfaces Wal-Mart would reject? The C6 audio system may sound great, but visually, it could have come out of the cheapest Chevy Aveo. That said, there isn’t much to complain about with the new Corvette. 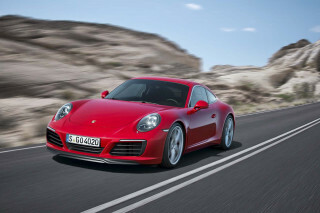 You’re getting performance to rival a 911 at the price of a Boxster. Compared to the Viper, this is an incredibly sophisticated car that makes it easy to drive at the limits, but doesn’t numb and dumb you down. Were more American cars as well-designed and engineered, Detroit would still dominate the auto industry. Engine:6.0-liter LS2 V-8, 400-hp, 400 lb-ft.
Corvettes has great get up and go power!!! I love my corvette. The handling of the steering is just great . You turn heads wherever you are because you're in a vette. I love it, lol.